Baby boy broke records of most premature babies born in the world. Tom Thum, a nickname given by nurses in German hospitals care for this tiny baby, born prematurely at 25 weeks of gestation. So tiny, so the altimeter seems so big for him. Tom Thum weighing just 9 ounces or 275 grams. The length from head to feet the size of a sheet of A4 paper. However, precisely because of its small size are the doctors believe that most premature babies in the world managed to survive and survive. 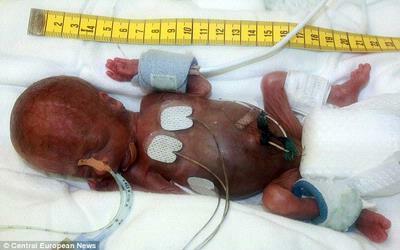 Record previously held by the premature baby Tyler Martin, who was born in New Jersey, USA, in 2004, weighing 320 grams. Meanwhile, for premature infants of women who live weight is 244 grams. Doctors generally believe that infants weighing less than 350 grams will not be able to survive. Birth of Tom Thum by the Section of Medicine, University Caeserean Goettingen in Germany in June 2009. After the doctor decided Tom Thum strong enough to be treated at home of his parents this week, the hospitals announced their success to Tom Thum alive. “After reviewing all official documents and medical science, we can say with certainty that Tom Thum is the smallest in the world of premature babies who survive, last year,” said Stefan Weller, spokesman for the university. Only three children had been registered as the smallest premature born in an emergency room of hospitals, all of whom are women. Again in December 2009, published after the baby is otherwise in good condition and able to survive after being treated intensively, so that weighs 3.7 pounds. This figure is considered the average weight of babies at birth in Germany. For 24 hours a day, all the time, the child is in the incubator and connected to feeding tubes, breathing, heart monitors, catheters, and most electronic devices to monitor vital signs of life every day. Day by day she grew stronger, until this week his parents were allowed to take her home. Identity withheld at the request of his parents. “I spoke with the parents of the baby. I hope when you grow up, it would become a hunter, “said Stephan Seeliger, a recognized expert in premature babies. The hospital was sure, though born prematurely at 25 weeks of gestation, Tom Thum become a normal and healthy child. “The crisis has passed. Now all the organs and limbs are well developed. The baby is now healthy and have normal weight, “the spokesman said.